Bags of imported rice - (Google Photo). Rice farmers in Nigeria are tired of all talk, no action. They are asking the federal government to declare war on rice smuggling by confronting the countries from whose border the rice are smuggled in. The countries identified by the indigenous rice farmers include: Benin Republic, Niger Republic and Cameroon. 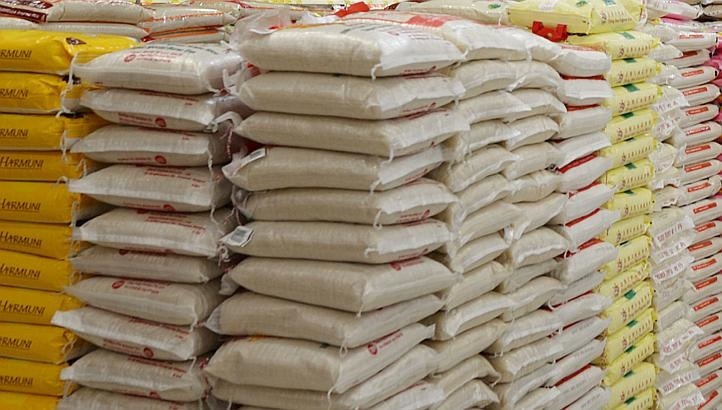 Recall that the Minister of Information and Culture, Lai Mohammed, had on Monday declared that smuggled rice from Thailand and India came into Nigeria through the borders with Benin, Niger and Cameroon. Speaking at a joint press briefing in Abuja on Thursday to announce the forthcoming 2018 Rice Conference that would hold in the Federal Capital Territory next week, the rice farmers said it is high time that the Federal Government declares economic war against countries sabotaging Nigerian business. The Managing Director/Chief Executive Officer, Agro Nigeria, a body of indigenous agro-dealers, Richard-Mark Mbaram, said the progress being recorded in the production of rice within the country is being threatened. “Yes, there has been progress thus far in rice production in Nigeria. However, we have serious systemic challenges facing this effort; and number one is smuggling. We know what the countries around us are up to. The figures they have for rice coming into their countries are more than the population which some of them even have. “Countries that share borders with us are stockpiling rice which they try to smuggle into Nigeria. So, Nigeria needs to take definite and radical measures. There’s no point playing big brother on issues like this anymore. It is about our life as a nation. It is about the business of our citizens,: Mbaram said.